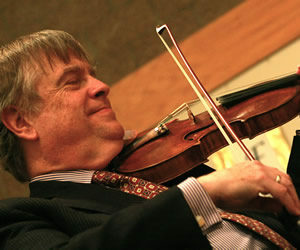 Violinist, violist, and conductor, James Buswell is one of the most versatile musicians of the 21st century. As a soloist, he has performed more than one hundred concerti with orchestras on five continents. In 2014 he expanded this list of solo repertoire with debut recordings of one Turkish and one American Concerto from the 20th century for release on the Naxos label. He was a Grammy nominee for his recording of the Barber Violin Concerto with the Royal Scottish National Orchestra. Distinguished conductors with whom he has collaborated include Leonard Bernstein, George Szell, Seiji Ozawa, Zubin Mehta, Andre Previn, Pierre Boulez, and Michael Tilson Thomas. It was natural for Mr. Buswell to take up the baton early in his musical career, and he has conducted opera, ballet, and symphonic repertoire also on five continents. Though celebrated as a soloist very early in his career, Buswell also became well known as a chamber musician and recitalist while still attending Harvard University. He performed at the opening of the Alice Tully Hall in New York with the Chamber Music Society of Lincoln Center, which he later joined as a regular artist-member. He has given world premiere performances and made recordings of works by many contemporary composers including Ned Rorem, Yehudi Wyner, Gunther Schuller, John Harbison, Gian Carlo Menotti, and Ellen Taafe Zwilich. James Buswell is also known as one of America’s pre-eminent teachers. He was on the faculties of both Indiana University and the New England Conservatory when each institution experienced a golden age of string pedagogy. He is in great demand giving master classes and workshops all over the world. Yet performance continues to be the center of his life as a musician, and praise for his “sensitive, evocative, compelling playing,” continues unabated today.